Left to right: Sue Mercieca, Nadia Portelli, Carmel Vella and Charlie Cilia at Cortina d’Ampezzo for the Ultra Trail challenge. 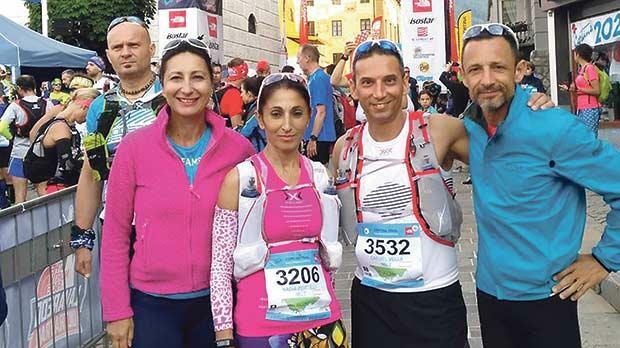 Agones SFC trio Charlie Cilia, Carmel Vella and Nadia Portelli along with Sue Mercieca, of St Patrick’s AC, recently took part in the Skyraces and Lavaredo Ultra Trail challenges in Cortina d’Ampezzo, Italy. The second edition of the Skyrace – a 20km race on mountain terrain with an elevation of 1,000m, took place in unusually hot temperatures. The winner was Italian Daniel Jung who made it home in one hour and 40 minutes. Cilia placed 12th overall from 391 starters after reaching the gantry in a time of two hours and two minutes. Cilia’s encouraging result in particular placed him in a good position for the European Mountain Championships in Arco di Trento, Italy. Mercieca completed the Skyrace run in three hours and 22 minutes to classify 80th in the women’s race and 253rd overall. Vella and Portelli tested their endurance skills at the Lavaredo Ultra Trail – a 47km race with an elevation of 2,650m. Both were aiming to better their times from last year which is exactly what they did when clocking 7 hours and 25 minutes and 7 hours and 38 minutes, respectively. Around 1,600 competitors, hailing from all parts of the globe, took part in the Cortina d’Ampezzo race. Vella placed 293rd overall and Portelli 350th. The race winners were Sebastjan Zarnik (Slovenia – 4:47.00) and Hillary Allen (USA – 5:15.00). All Lavaredo Ultra Trail races – which have strict cut-off times – carry important points for participants in the annual race for slots at the Ultra Trail Mont Blanc series in Chamonix, France, in August. The International Trail Running Association was formed in 2013 following a boon in the sport and it is now recognised by the world athletics body – IAAF.